Mumbai-based Impact India Foundation (IIF) is popular world-wide for launching the first ever mobile hospital train, called the Lifeline Express or Jeevan Rekha! The Lifeline Express Project was introduced to prevent and cure disabilities for the poorest of the poor in rural India. This five coach train has the best infrastructure and equipment for conducting various surgeries and providing preventive treatment on site. The train travels to districts where there are few or no clinics and is stationed there for three weeks. Besides surgical services, aids and appliances along with medicines are distributed and counseling is provided. Doctors and medical students from across the globe come over to India to volunteer with IIF’s Lifeline Express and provide high quality medical care and in turn gain extensive exposure to different illnesses. Community Health Initiative is another project initiated by IIF. Under this project, four mobile vans have been introduced where the vehicle carries equipment to treat patients. The Mobile Hospital on a train concept has been a huge success across the globe. China recently replicated this model and recently introduced a similar train with the help of IIF. There are other developing nations working to launch this convenient mobile hospital. IIF is currently in talks with the Maharashtra State Government to launch a state owned mobile hospital train. Since 1991, the Lifeline Express has medically served 850,000 patients by restoring sight, movement, hearing or correcting cleft lips. This translates into an average of almost 39,000 interventions each year for 22 years! The project has given 150,000 doctors and students and several thousands of volunteers the opportunity to experience treating patients in this uniquely designed mobile hospital. During FY13, the Lifeline Express reached out to over 63,000 patients across eight districts and over 3,600 surgeries were conducted. Through Community Health Initiative, IIF reached out to tribal areas in Thane district. The project reaches out to 60,000 tribals providing them medical services on IIF’s four mobile van clinics. The strong 49% Y-o-Y jump in IIF’s total income to Rs40.2mn in FY13 was owing to increase in donations received from institutional donors. Donation from the Mahindra Group had almost quadrupled during FY13 (i.e. from Rs2.7mn in FY12 to Rs10.8mn in FY13). Other institutional supporters like Volkart Foundation, Pirojsha Foundation, Abott India and others had also increased their share of donations during FY13. 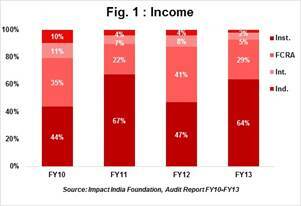 66% of total donations during FY13 (50% in FY12) was raised domestically. On an average during FY10 to FY13, donation raised from local sources stood at 60%. 90% of total expenses was directly spent on beneficiaries in FY13; highest in the past 4 years (90% includes: 56% on programs, 32% on staff directly involved in executing programs and remaining 1% on traveling). IIF expended 73% of total direct program cost of Rs33mn on Lifeline Express project and 27% on Community Health Initiative during FY13. Earmarked funds of Rs11mn are available for its three main projects: Rs6mn for New Lifeline Express, Rs48mn for CHI and balance towards existing Lifeline express. 23 out of 58 health-focused nonprofits listed on HelpYourNGO.com have borrowed funds (loans) as of FY13. Whereas, IIF has availed no credit lines in past 4 years; suggesting IIF’s ability to raise donations sufficient to meet its program and operating costs. There are 13 health-focused nonprofits listed on our website which have sizeable investments (above Rs10mn). With investments of Rs18mn as of end FY13, IIF is one of them and indicates its healthy financial position. 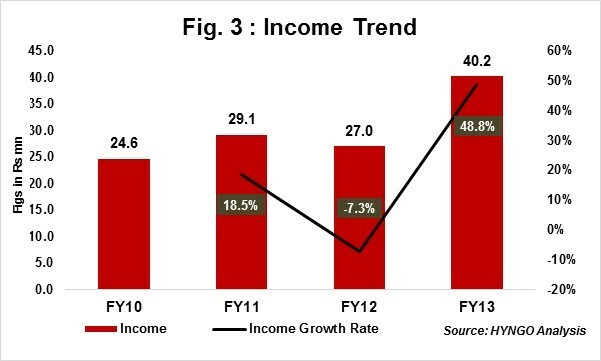 IIF posted a double digit 4-Year total income CAGR of 18% during FY10-FY13. IIF has been around for over three decades and is a matured organisation, where the growth rate is expected to stabilize, unlike the super normal growth rates observed in early/growth stage non-profits. 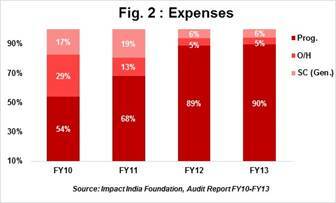 However, IIF is confident that mandatory CSR spend by corporates will further advance its topline. Self Sufficiency Ratio (SSR) indicates an organisation’s ability to meet its operating expenses from its own income like interest fee, service charges, and general donations. For IIF, SSR for FY13 was relatively low at 7.8% v/s 9.6% in FY12. Low SSR indicates that the organisation is highly dependent on external funding as it has no activities generating income from its own activities. On the other hand, IIF has large number of recurring donors v/s one time donors. During FY13, 61% of total income was received from repeat donors, whereas 39% was raised from new donors. This indicates donors’ confidence and trust in IIF’s mission and mitigates to a large extent the risk inherent in a low SSR. Keeping track of a patient’s health after the surgery/treatment is done. To overcome this challenge, IIF has joined hands with local clinics (located at a distance of 5-10kms from the village). Limited infrastructure. Runs only one train, thereby repeat trips are not often possible to the districts already visited. To address this, IIF has set aside a corpus of Rs6mn towards a New Lifeline Express. Villages with poor infrastructure and no access to railways remain uncovered. Low share of contribution from individual donors. The proportion could be increased by direct marketing or listing IIF with fund raising portals to attract donations from the retail donor community. Mrs. Zelma Lazarus has been serving IIF as the CEO since past 30 years. She is a highly respected individual in the non-profit space, both in India as well as other foreign countries. She was appointed as 'World President’ of International Public Relations Association (IPRA) and was the first woman in Asia to be honored with this role. She is involved in the day to day activities of IIF. The Governing Board of IIF currently consists of six trustees, most of them are industry veterans from varied fields such as health, banking, environment, FMCG and finance. IIF has a separate team of eight qualified doctors under its ‘Medical Advisory Board’. All eight doctors frequently travel to treat the needy. Management team consists of eleven members, some of whom have been with IIF for more than 15 years. The role of each member is well defined across different projects. The Governing Board is non-active and intervenes only when required. However, the other two teams are active and participate regularly in board meetings. Health records of every patient treated on Lifeline Express is maintained and shared with clinics/hospitals for further treatment, if required. In addition to this, IIF’s Annual Reports, newsletters and other collaterals are detailed and shared with all donors regularly.